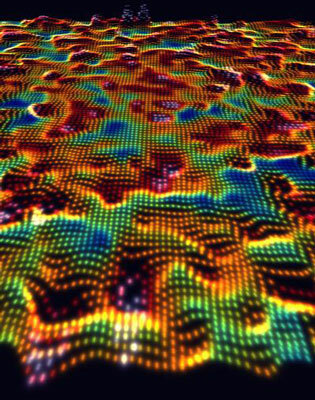 (Nanowerk News) Just as the heartbeats of today's electronic devices depend on the ability to switch the flow of electricity in semiconductors on and off with lightning speed, the viability of the "spintronic" devices of the future -- technologies that manipulate both the flow and magnetic "spin" of electrons -- will require similarly precise control over semiconductor magnetism. On the brink of the metal-insulator transition, the electrons in a manganese-doped gallium arsenide semiconductor are distributed across the surface of the material in complex, fractal-like patterns. These shapes are visible in this electron map, where the colors red, orange and yellow indicate areas on the surface of the semiconductor where electrons are most likely to be found at a given point in time. In this image, the fractal-like probability map of electrons is superimposed on the atomic crystal structure of the material, imaged at the same time.